have you already guessed this week's theme ♥JINGLE BELLES♥?! the title, "A BANNER HOLIDAY " ought to give you a hint: yepper, we're making holiday cards inspired by any aspect of our new (for 2012) blog header that appeals to you, whether that's the color scheme, the funky retro styling, or any of the individual elements, such as the glorious glitter or the fun and festive bells... or all of the above! our header was made in PSE9 by me (lauren!) 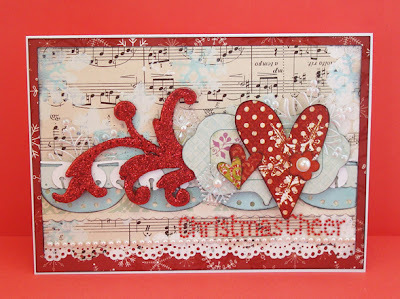 using paper, brushes and elements from an utterly gorgeous kit called artplay palette: retro holiday, by one of my favorite digital designers, anna aspnes, purchased at o'scraps; the fonts are deftone stylus, bohemian typewriter and impact--all free from dafont.com; and the divine sparkliness of the lettering is thanks to flergs' over the rainbow glitter layer style from scrapbook graphics, which i learned how to use via this great tutorial! Lauren says, "i may have gone a little crazy with the inspirations this time! 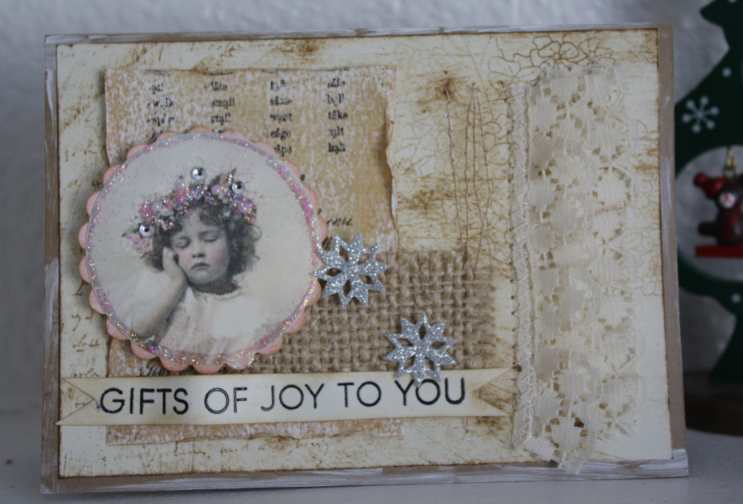 i used the color palette, obviously, and the fabulous (though slightly hidden) memory box jingle bell die that miss lorraine gave me for xmas (thank you! 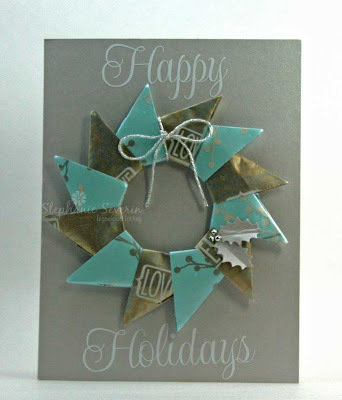 ); and then i've also got the grungy vibe of the header working with some messy stenciled snowflakes and dots, plus i've got red glitter chipboard (of course, lol!) and i went a bit vintage and collagey with a lot of little fanciful layers, just the same way i did-- digitally-- making the header." Stef says, "I took my inspiration from the color palette of the banner (although slightly deeper hues) and added some golden glittery Memory Box jingle bells (thanks Lorraine). Papers are Basic Grey Jovial with sentiment stickerz from EAD Designs Sweet Sweet Christmas and this week's CardPattern's Sketch." and now it's time to see what ♥YOU♥ will do with "A BANNER HOLIDAY"! remember you can use *any* aspect of the header that inspires you: the colors, the retro style, the various elements, it's all fair game... so feel free to be as literal or as abstract as you like! link up here by 6pm (EST) on wednesday, february 8th. keyword for galleries or our flickr group is JB12-03. First, a big THANK YOU to our lovely sketch designer & sponsor for this jingle belles prompt ~ Kirsty Vittetoe & Pixie Dust Paperie. 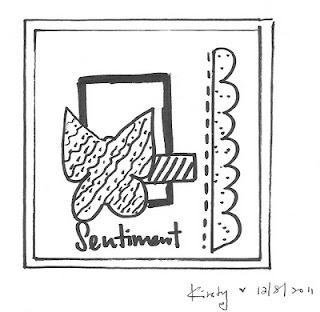 So many fabulous variations on Kirsty's wonderful sketch ... we love seeing all of the different interpretations. 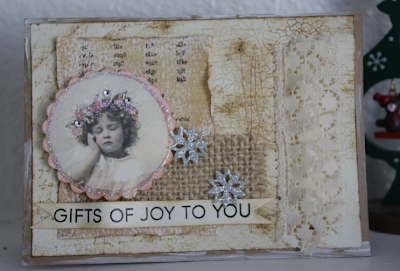 with the perfect combination of patterned papers, stitching & pearls. oh yeah, and did I mention she made six of them ... Woot Woot! how do you not love that beautiful row of roses. E-mail us, so we can get your goodies on the way. And if you haven't already, stop by and check out all of the awesome sketch card designs & leave a little jingle belle love ... and check back at midnight for a new prompt to inspire you. Lauren says, "the starting point for this one was the fabulous santa illustration--which is actually a very reduced scan of a vintage book my friend gina gave me. (i collect copies of "the night before christmas!) then, once again i only needed to follow kirsty's awesome "road map" in choosing and placing my embellishments, so this came together quickly and easily!" 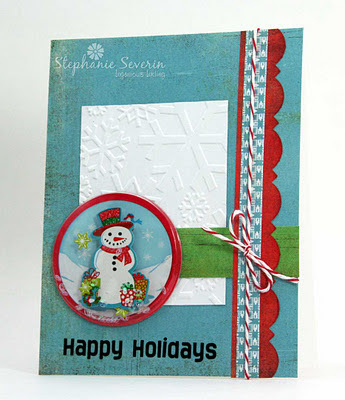 Stephanie says, "I continued with my shaker stickers ... It was fun to make two cards that were similar, yet different. For this one I pulled out the black in Santa's belt with some black twine, black elements in my designer paper & a black rub-on sentiment from EAD Designs." And remember, the very generous Kirsty is offering a FIFTEEN DOLLAR GIFT CERTIFICATE to the Pixie Dust Paperie Shop to one lucky randomly selected card maker who links up with us this time. You may enter as many times as you'd like, but each card must be a newly made holiday card and use the sketch! We are overjoyed to have the talented Kirsty Vittetoe joining us again at jingle belles with one of her fabulous sketches to inspire us. Many of you know Kirsty as the creator & lead DT of the awesome City Crafter Challenge Blog ... as well as the owner & Pixie-in-Chief of Pixie Dust Paperie, for which she puts together a wonderful collection of the latest & greatest papercrafting goodies each and every month, and now there's a Pixie Dust Paperie Etsy Shop, too. You can also see all of her amazing creations on her blog... Handmade Little Things. 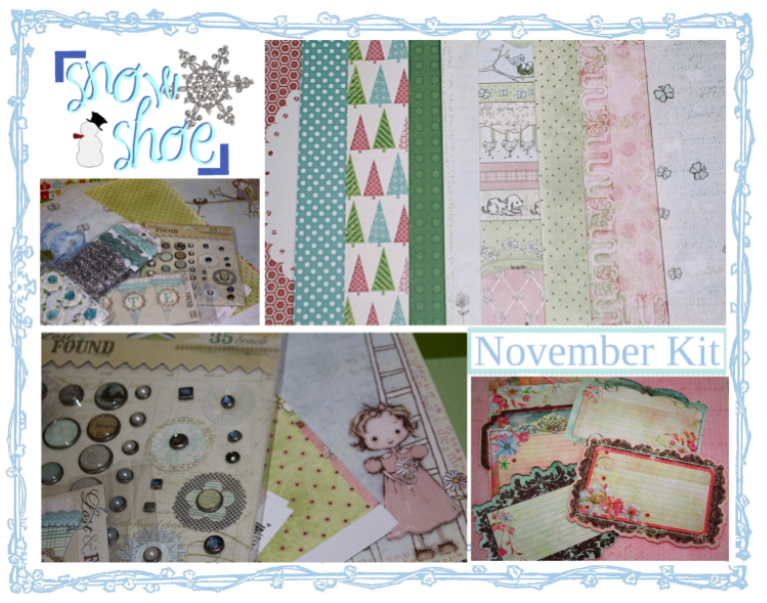 Kirsty says, "I am glad to be able to come up with a sketch for Jingle Belles once again! I have a little sketch book, where I jot down anything that came up to my mind, I look through them when I need one, make changes if I have to, the rest is pretty much ready. It is really exciting to see every one's interpretation of my sketch!" Lauren says, "I treated myself to a few new holiday goodies in the after-xmas sales, including a pack of vintage-inspired october afternoon "holiday style miscellany" and these fabulous dimensional poinsettias from irene's garden; and of course when you have *NEW* stuff it's the first thing you want to use, right?! since kirsty's sketch gave me the perfect "road map" to know where each element should go, this was a super-fast card to make!" 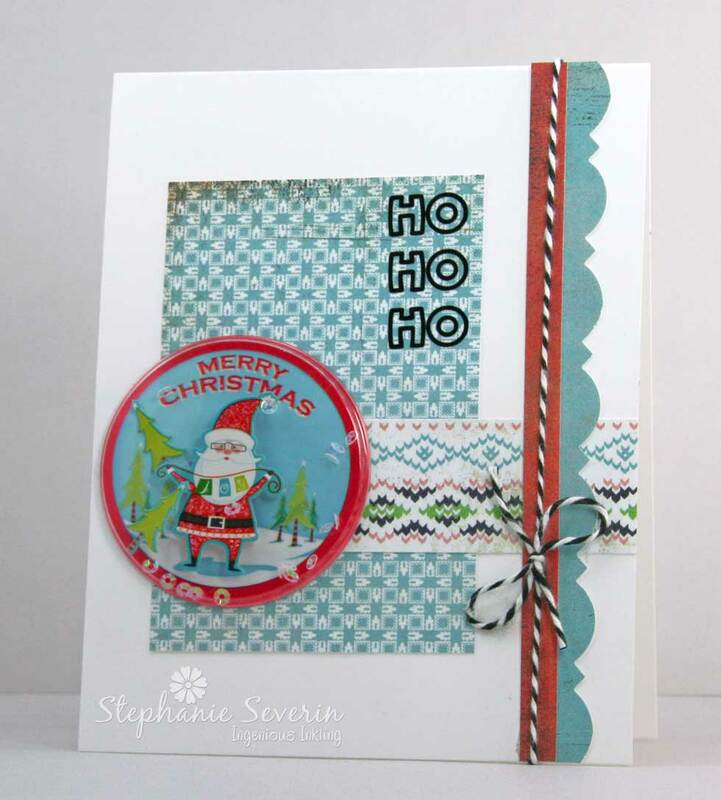 Stephanie says, "I found this cute little snowman shaker sticker in the after-Christmas-bargain-bin & thought it was a perfect element for this week's sketch. 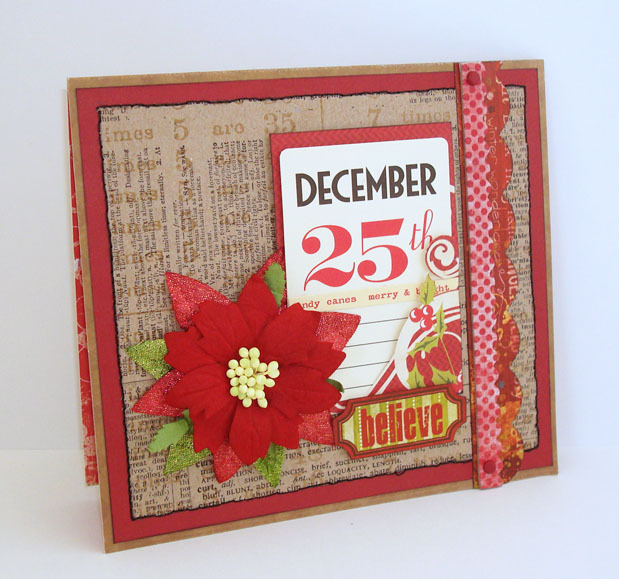 I used colors from the sticker to inspire my card (this is a great sketch for scraps) & added an EAD Designs rub-on sentiment and wrap of red baker's twine to complete the design." We hope that we've inspired you to get sketchy with it this week, but if you're still "on the fence" we should mention that the very generous Kirsty is offering a FIFTEEN DOLLAR GIFT CERTIFICATE to the Pixie Dust Paperie Shop to one lucky randomly selected card maker who links up with us this time. You may enter as many times as you'd like, but each card must be newly made and use the sketch! Remember, you have almost two weeks ... until Wednesday, January 25th at 6pm EST ... to upload your sketch cards ... and use keyword JB12:02 if you upload to our Jingle Belles Flickr Gallery (or any other gallery). upheld her new year's resolution to "mix things up" with a non-traditional card in which a giftwrap background, one die cut, one stamp, and some gorgeous bling combined to knock our socks off! 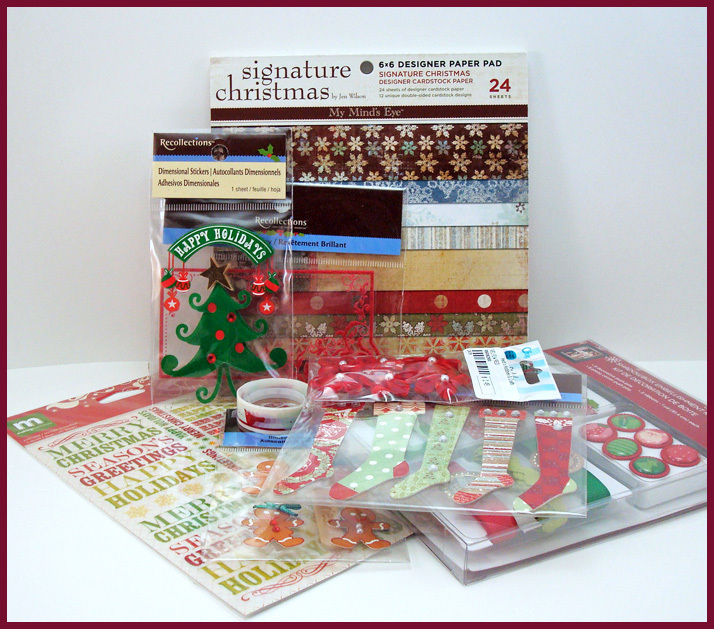 enhanced the perfect presenty patterned paper with ribbon, florals, bling and ink... that all add up to one elegant masterpiece of a holiday greeting! 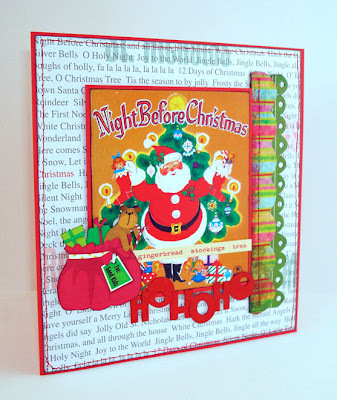 created a card in which any ONE of the brilliant elements--clever easel design, ruffly layered tree, or the fabulous 3D presents--would have wowed us; taken all together they're a show-stopper! 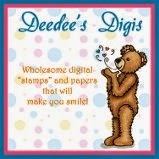 mme 6x6 paper pad, making memories rub-ons, offray ribbon flowers, recollections stickers... and more! so which of our lovely cardmakers is going to get these fun holiday-themed products? congratulations, lisa! 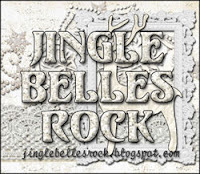 please email us at jinglebellesrock @ hotmail [dot] com to claim your prize!!! MORE time like the presents! just a reminder that this year we're posting our creative prompts every OTHER friday, so if you'd like to get in on the fun with our current theme, NO TIME LIKE THE PRESENT(S), you still have until next wednesday evening! please scroll down to see the original post, ogle the gorgeous cards made by our lovely guest stars, and link up your own creations! stef says, "This was my first attempt at origami wrapping paper folding. a wrap of silver cord, and an EAD Rub-on Sentiment finish the design." lauren says, "i almost always have a couple of totally conflicting ideas for any prompt and often my biggest problem deciding which to use... which is one of the reasons i'm excited about getting TWO shots at each one this year! 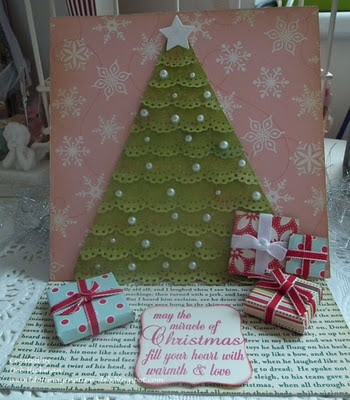 you can see i went in a completely different direction with this card, and in my collage i've included some chipboard presents in addition to MORE giftwrap usage in the form of that beautiful holly leaf background paper. 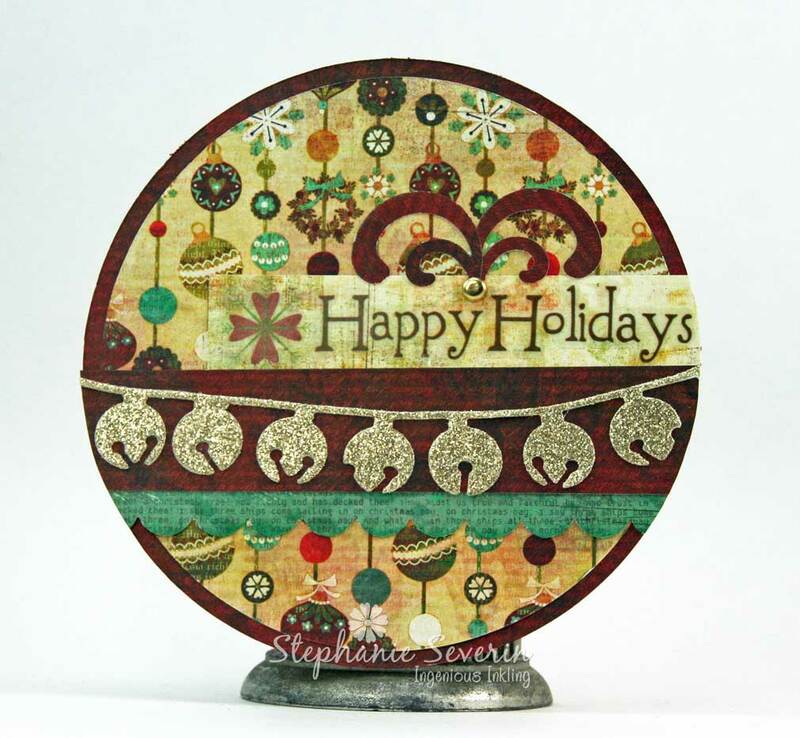 by the way, the silver "jingle bells" were cut using a memory box die that i predict you'll be seeing A LOT OF this year--the lovely miss lorraine gave one to both stef and me for christmas, and we are IN LOVE with them, for obvious reasons! (thank you, lorraine!! !♥)"